Posting from the evening after the 2018 German Logic Masters. It went decently well for me, with a third place after the main rounds which means I’m on the A-team again. My results on the two Rätselportal-rounds were bad as expected. On the other hand, finishing that fences sprint round first with quite a margin after 3:15 of 20:00 minutes was great. An unfortunate marking mistake in the final playoffs saw me lose a couple of minutes of time double-checking my correct solution. With no good way to fix this, I ended up fourth with the knowledge that first place was possible. I made a couple of puzzles to prepare, two of which I’ve published on the Rätselportal already: A Japanese Sums/Masyu hybrid and a hand-constructed (with the help of a friend, thank you!) unclued 5×5 skyscraper blocks that I’m very happy with! Some more I’ll post here. To start, here’s a The Largest Number. The type was introduced at the 2017 WPC in India. I don’t think I’ve seen one without given numbers before. 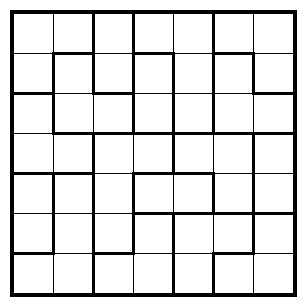 Rules Fill the grid with numbers such that each room contains the numbers from 1 to the size of the room. Equal numbers can not be next to each other horizontally or vertically. Circle the largest number in each room. Then also circled numbers can not be next to each other horizontally or vertically. This entry was posted in Puzzles and tagged japanese sums, largest number, masyu, puzzle, skyscraper blocks on 2018-06-09 by rob. Some more Hochhausblöcke. 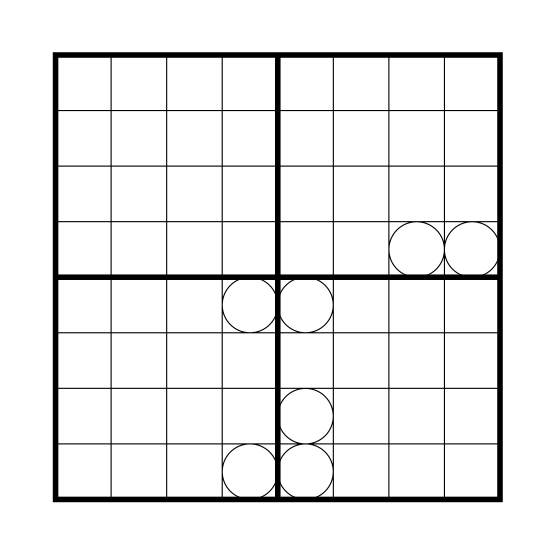 In other news, the 10×10×10 series on croco-puzzle continues, and I submitted a few puzzles to the excellent puzzlepicnic, including a Fences puzzle where I’m curious to know if people find the intended break-in, and a Yajilin. Rules Place numbers from 1 to 4 in each cell so that each row and column of each 4×4-block contains all numbers 1 to 4. 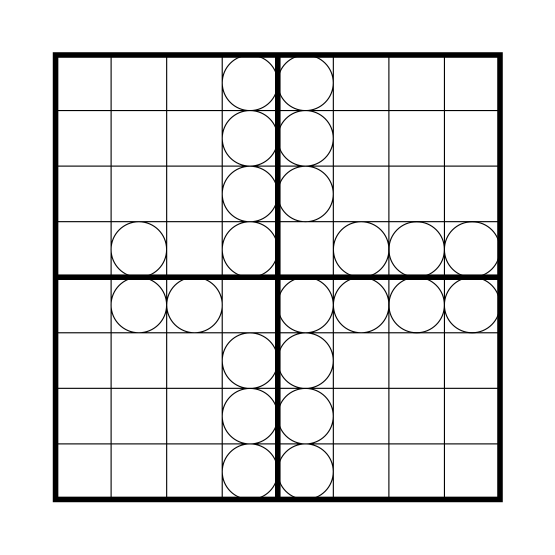 Circled numbers are valid skyscraper clues for the adjacent grid (for both adjacent grids in the central corners). 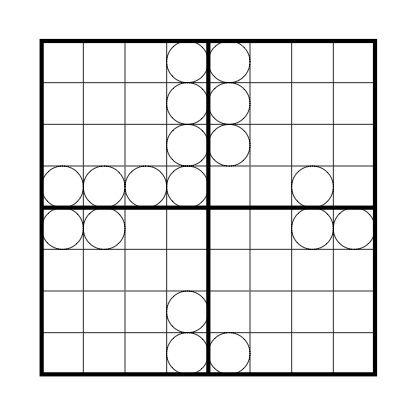 Uncircled numbers are not valid skyscraper clues for the adjacent grid (for neither adjacent grid in the central corners). This entry was posted in Puzzles and tagged medium, skyscraper blocks, skyscrapers, variant on 2016-07-27 by rob. This entry was posted in Puzzles and tagged hard, skyscraper blocks, skyscrapers, variant on 2016-06-26 by rob. Hochhausblöcke is a neat skyscraper variant that showed up in the Rätselportal round. 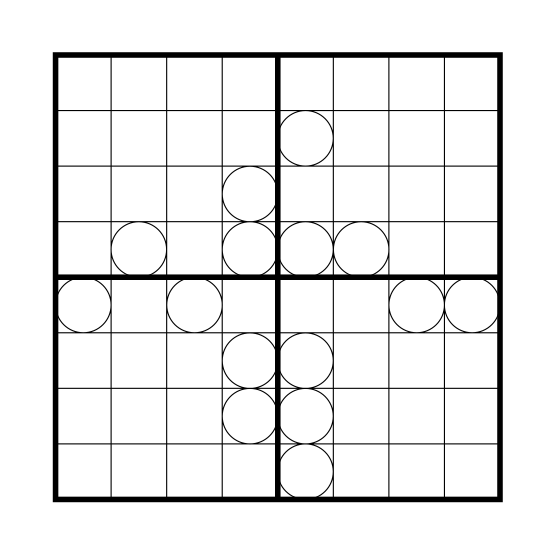 They’ve usually been less regular, but from the instructions it was clear that the one on the competition would be an 8×8-grid. I thought there was a good chance of a puzzle without outside clues, and certainly the interactions involved there need more practice, so I tried to construct such a puzzle. I kept running into dead ends, started doubting that they exist at all, and threw the computer at the problem. It turns out that there’s a lot, but they’re rare enough: there’s a good 200000 excluding symmetries, or a little under 1% of all clueless grids you could write down. It should not be unreasonable to find one by hand. Here’s one. This entry was posted in Puzzles and tagged medium, skyscraper blocks, skyscrapers, variant on 2016-06-18 by rob.